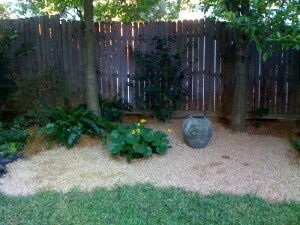 How a garden makeover works. Much like an experienced decorator can rearrange furniture or suggest just the right accessory to make your interior spaces reflect you, I will listen to your concerns and your ideas and suggest ways to improve the look of your landscape to provide the exterior environment you desire. Gardens reflect personal taste so an open exchange of thoughts and ideas is critical. The first step is for me to visit your garden, listen to your wants and needs and then assess your existing landscape. Usually, there will be obvious suggestions that we can discuss on the spot. If that satisfies you and you are comfortable with your own ‘to do’ list, then you have the notes you took and we are done! I take notes and photos, too, so I can refer back to them when needed. Once you are a client, I am always available by phone or email for questions about your garden. If your issues require some thought and research and you are interested in a more detailed plan, then I will come back to you with recommendations. This may involve another visit to your garden or may be done by sharing information and photos by email depending on what works best for you. You can implement the recommendations yourself or engage landscape workers you already employ. If you need professional installation, arborists, sprinkler companies, lighting experts, etc., I will be happy to recommend sources that have proven to be reliable and professional. If you wish, I can go shopping with you for plants and flowers at local nurseries so I can guide you and you can purchase and install them yourself. And you may consider periodic makeover checkups, seasonally or annually. Call 214.676.4361 or email Cheryl@McCueGardenMakeovers.com for more information or to schedule a consultation.